... you make your products - but we're not talking lemonade here. We're talking home and personal care. The vision for my blog and my other social media sites is to encourage you to find your truths in wellness; which is multi-faceted. Wellness is more than just nutrition (though it is the foundation for everything) but wellness embodies advocating for your life in the decisions you make. I want you to see that making your own products can be empowering and you don't have to take it all on at once. Pick a recipe you want to try, incorporate it and let it become your go-to then add another one. 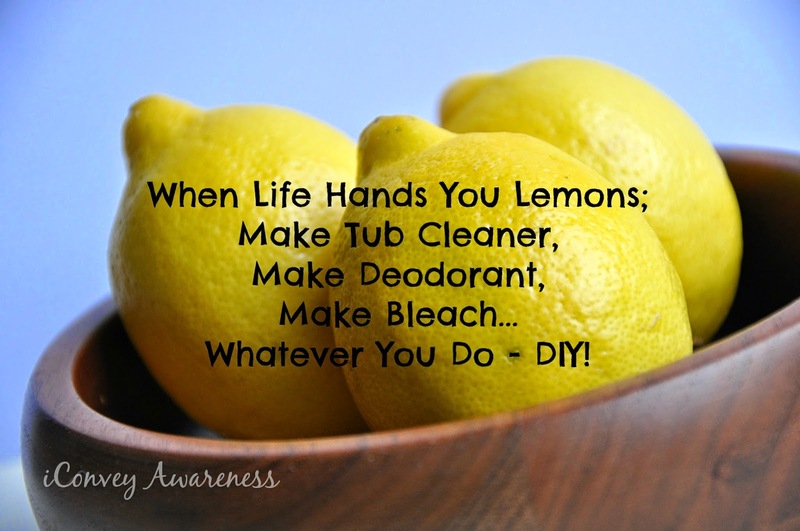 So, when life hands you lemons, maybe you can make a tub and tile cleaner with a bit of baking soda and a little elbow grease or you can use them to make an alternative bleach with a couple other common household ingredients. The choice is yours! Be open to learning, sharing, and growing. Handcrafted Honey Bee was founded with the goal of helping you to create healthy, handcrafted skin care products with ease in the comfort of your own home. View our selection of kits, find us on social media, and let your love affair with creating your own skin care begin! Give DIY a try! You may surprise yourself with your innate know-how. Your house will be clean, your kids can help, and there will be no harmful chemicals to breathe in. Your house will not smell like Clorox, but it may have small hints of lemon here and there and who doesn't like lemons? Oh, well, if you don't like them try lime juice! If you're allergic to both then skip the lemons, and go with baking soda. And, if you're not feeling any of those options, trust me, there are a ton more! In the guest post on Handcrafted Honeybee, you'll learn how I was able to repair my own hair after a hairdresser said I need to cut it all off. Sounds kind of like other practitioners that may make people feel there is no other option. There IS always another option but you have to be willing to put in the time and effort AND speak up! Feel confident this day that you can advocate for your own wellness in all regards! Don't forget to click over to the guest post here. I make a few products on my own and I just found out that there are TONS of uses for Castile Soap so I'm pretty excited about that. Thanks for sharing at Savoring Saturdays! Love your ideas. :) I love using just the peels in vingear cleaner.